Most planners have preset layouts, so you must adapt to your planner. before we print and assemble your individual planner. 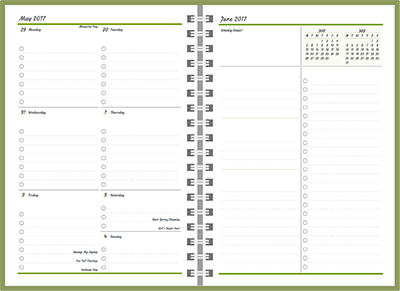 Agendio offers dozens of custom planner options, including many not offered by any other planner company. Which ones will you want to include in your agendio? Check out ten of our best features here or see all of them at the Options and Features page. Many of our pagelets offer detailing, so you can customize your pagelets with lines, dashed lines, checkboxes and other visual details, as well as a variety of line spacings. Do you like plain pagelets or do you prefer them to be lined? Do you want to check off tasks as they are done, or simply cross them out? It’s up to you. Standard to-do lists quickly become very long and disorganized. You can’t see what's more important or what goes together and you have to go through the entire list to find anything. Agendio’s Divisible pagelets are the solution: They can be subdivided into many smaller pagelets, each with its own label. Agendio offers dozens of customizable Extra Pages. Our pages include lined, dotted, grid and blank, as well as Habit trackers, Meal planners, Financial pages, Contacts, Year-end carry-over pages and even Tables with flexible column widths. Customize them with your details to make them even more functional and effective. Add planning pages to your agendio but first customize them to your needs. Your plans are specific to your needs, as are agendio planning pages. Does the week start on Sunday or Monday? We don’t know, which is why, at Agendio, you can choose any day to start. You can even start your weekly and monthly on different days. For example, you can start your weekly on Monday and your monthly on Sunday. Customize your schedule start time, as well as the design, line spacing and more. You can even replace one or all of the hours with labels such as Lunch or Recess. You can shade sections of your agendio, whether to accentuate important sections, such as your schedule, or simply for visual effect. Shade as few or as many sections as you like. You can add monthly tabs to your agendio. Select one of three styles and the tab content will be added in the same font and color as your planner pages. You can also add up to two personalized tabs to be placed with your extra pages. Many of your tasks require more than one day. Wouldn’t you prefer that your planner show these tasks over many days, in a space designed specifically for this purpose? We do exactly that with our span pagelets. Are you looking for a planner or inserts? Choose the types of pages to include from dailies, weeklies, monthlies and note pages. Select your specific layouts from our wide selection. Customize your layouts to suit your preferences. Add your activities, events and holidays. Add tabs, elastics, page markers and other accessories. Preview your agendio to make sure it’s what you want. "Great quality and layout and fountain-pen-friendly"
"I've seen lots of other customizable planner websites before, but Agendio has the most options by far." "My Agendio arrived today, and I could not be happier with it! The binding is beautiful, the size is absolutely perfect, the printing is terrific quality... I could go on. So I will! The design process was fun and intuitive, and had just enough options to make the design feel truly personalized… I don't think I could go back to using a stock planner after this. WELL worth the price (a fully custom planner under $50?? What planet am I on?)... Agendio has made a customer for life :)"
MORE ACTIVITY, EVENT AND HOLIDAY CUSTOMIZATION!